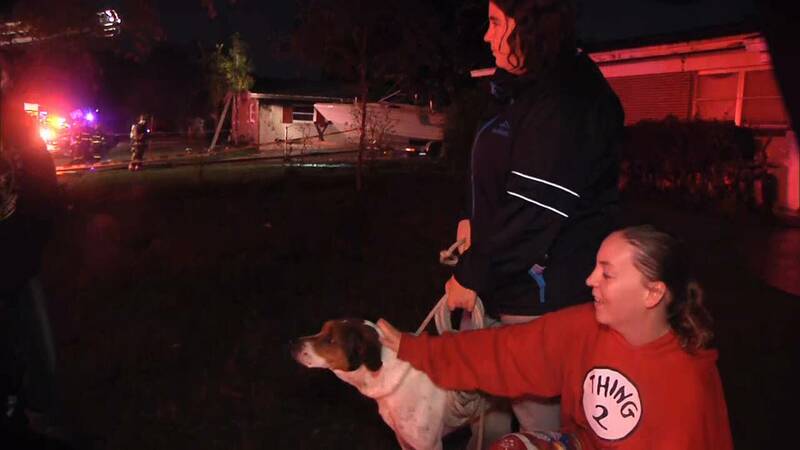 EATONVILLE, Fla. - A neighbor's dog is credited for saving three people from a house fire near Eatonville. The fire broke out around 12:30 a.m. Wednesday at 1518 Leeway Avenue in the Kingswood Manor subdivision. The family's next-door neighbor, Amber Walker, said she couldn’t sleep because her dog, Angel, kept jumping up and down. When she looked out the window, she said she saw flames coming from her neighbor's garage. “Me and my little brother bolted out of the house and ran to the neighbor's house and banged on their door so we can get the kids out, so they can be safe,” Walker said. A neighbor's dog helps rescue a family from a house fire. A battalion chief with Orange County Fire said the home was badly damaged. Maitland firefighters assisted in battling the blaze. The Bureau of Fire & Arson Investigations will investigate the cause of the fire.